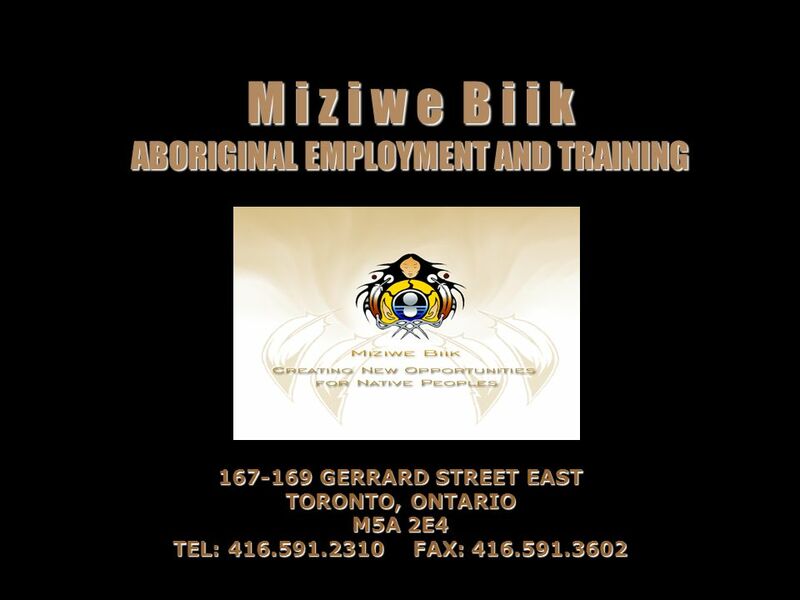 M i z i w e B i i k ABORIGINAL EMPLOYMENT AND TRAINING 167-169 GERRARD STREET EAST TORONTO, ONTARIO M5A 2E4 TEL: 416.591.2310FAX: 416.591.3602. 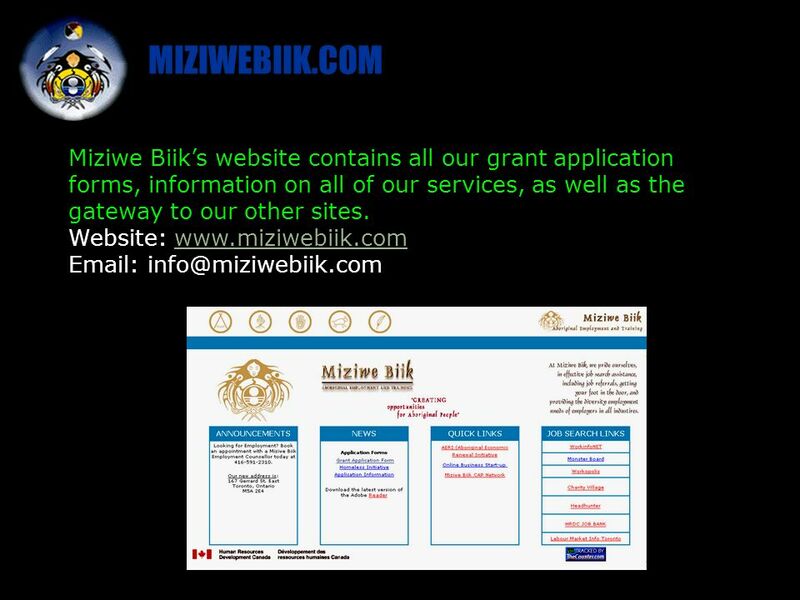 2 MIZIWE BIIK …...is committed to assisting all persons of Aboriginal ancestry, in the Greater Toronto area, to attain a better quality of life....believes that community needs and aspirations are paramount. We are committed to strengthening the community through partnerships promoting equality and self reliance....strives to provide training and employment opportunities in a supportive environment in which people can affirm their Aboriginal identity and develop to their full potential. 3 BACKGROUND Miziwe Biik Aboriginal Employment and Training was created in 1991 to meet the unique training and employment needs of aboriginal peoples. Formerly, The Greater Toronto Aboriginal Management Board (G.T.A.M.B), MIZIWE BIIK was given to us by Elder Jim Windigo. Our name is associated with the female water spirit, and means water that flows around us. 5 SKILLS DEVELOPMENT PROGRAM Topics include: stress management, job searching, resume and cover letter preparation, labour market information. This program also features a two-week introductory computers and word-processing software. Graduates of this program either obtain employment, apply for training or return to school to obtain their GED certificate, or college certificate in a particular program. 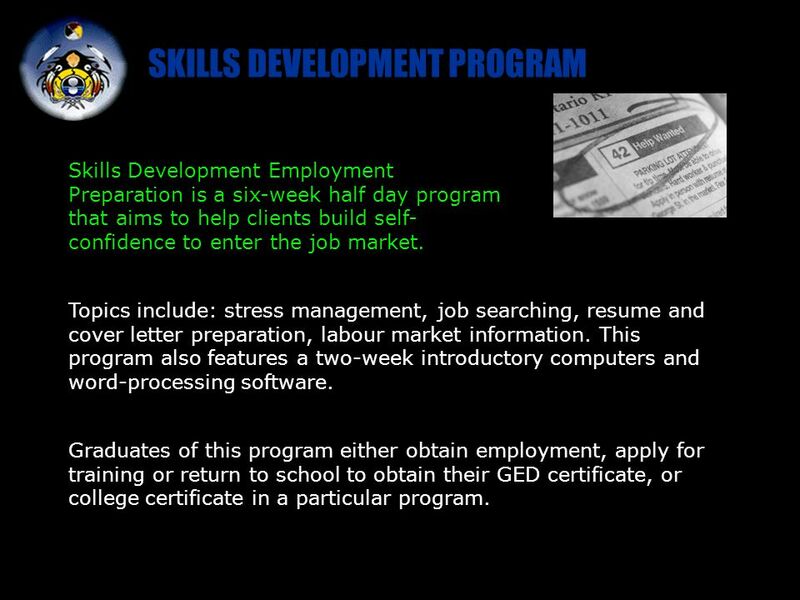 Skills Development Employment Preparation is a six-week half day program that aims to help clients build self- confidence to enter the job market. 6 SUCCESS STORY Employment Preparation Program Opal Johnson Developmental Service Worker Native Child & Family Services Opal recently relocated from Nova Scotia, with the hopes of finding employment in her field which is working with Aboriginal children in a variety of positions. Opal attended the Skills Development training program, and just days before completion of the program was diligently job searching. Opal was offered a position at Native Child and Family, as a Developmental Service Worker where she is able to utilize her expertise with working with children. 9 SUCCESS STORY Targeted Wage Subsidy Lynn Hubley Office Manager Jeffery Hewitt, Barrister and Solicitor This Seneca College graduate with the right combination of education and training made her an ideal candidate for this placement. Lynn demonstrated exceptional management abilities which exceeded the sponsors expectations and now has greater freedom and responsibility, as she manages the day to day operations of the firm. 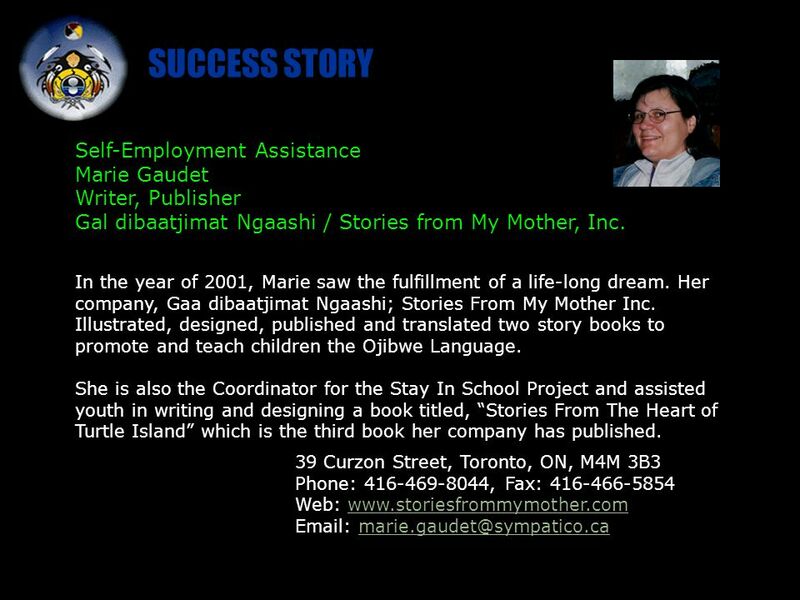 10 SUCCESS STORY Employment Assistance Support Measure Loretta Watetch Personal Support Worker Certificate George Brown College Loretta, employed at Native Canadian Centre, successfully completed and received a certificate in Personal Support Worker from George Brown College. Miziwe Biik assisted with additional costs of taking the course. She now is gainfully employed in the Seniors Program. 11 SUCCESS STORY Purchase of Training Julie Debassige Certificate in Infant Mental Health York University Julie completed the course and received her certificate this year. This course is directly related to her career goals and she anticipates to secure a position in the near future. 13 Employment Assistance Support Measure Toronto Building and Construction Trades Council A partnership between Miziwe Biik and the Construction Trades Council provided a variety of training and employment opportunities in the trades. Through this program, many received certification to join unions which lead to gainful employment for most participants. 15 SUCCESS STORY Self-Employment Assistance Ernie King Northwind Mechanical Sole Proprietor Ernie has over 18 years of experience and his company Northwind Mechanical currently holds contracts with a few Toronto area organizations, residential homes and a condominium building. The next tasks that Mr. King would like to accomplish are a storefront business and develop a H/A/R/V mechanical apprenticeship. 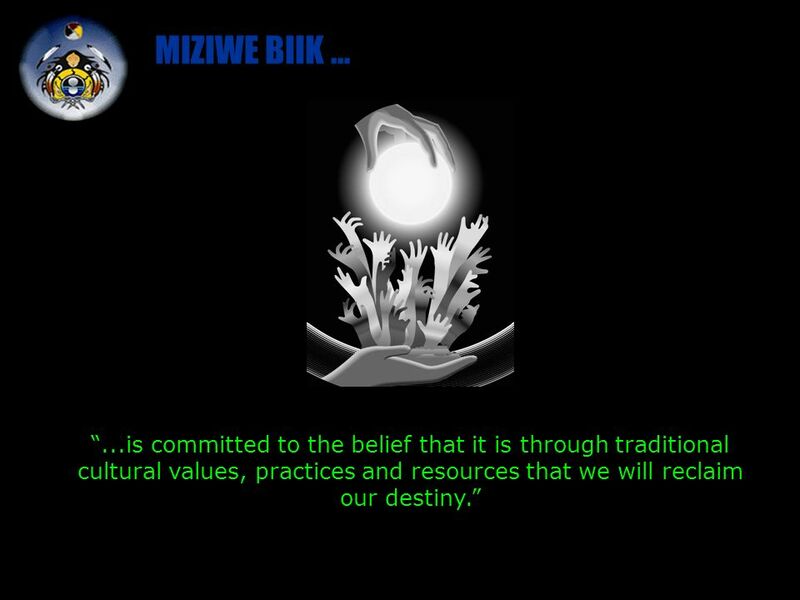 20 MIZIWE BIIK …...is committed to the belief that it is through traditional cultural values, practices and resources that we will reclaim our destiny. 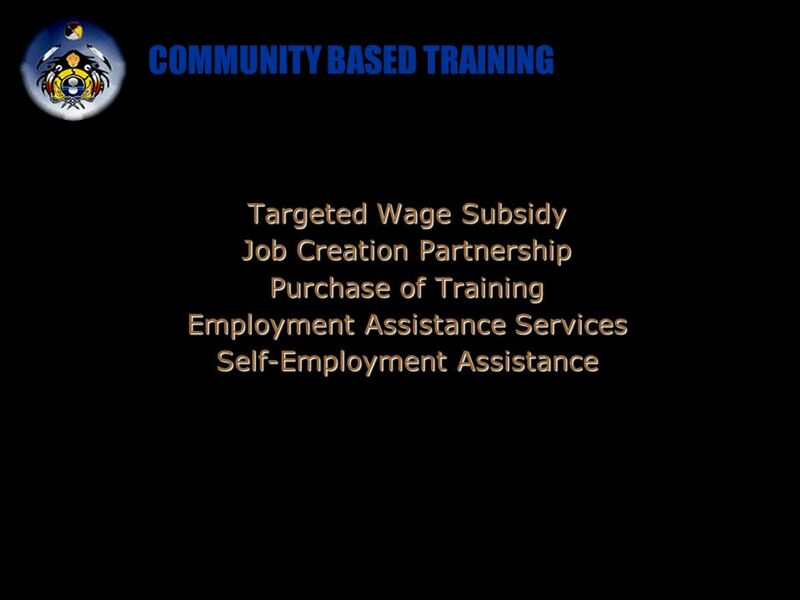 Download ppt "M i z i w e B i i k ABORIGINAL EMPLOYMENT AND TRAINING 167-169 GERRARD STREET EAST TORONTO, ONTARIO M5A 2E4 TEL: 416.591.2310FAX: 416.591.3602." Click to edit Master title style Year Five Concurrent Education Biidaaban Community Service-Learning Student Placement. Heading to the Workplace? Everyone will end up in a workplace environment, so it will help you to gain information on how to prepare to enter the World. 1 WeCAN Works Presentation Monday, December 14, 2009. WELCOME... To A Presentation on vpi Employment Services. KEITH MUNSON CAREER SPECIALIST & EMPLOYER DEVELOPMENT STROMMEN CAREER & INTERNSHIP CENTER LOWER LEVEL ANDERSON HALL Job Fair Success: Tips for Interviewing. OGIP Basics. What is oGIP? OGIP PURPOSE? Market Value Individual Value. Sudbury Vocational Resource Centre 124 Cedar St. 3 rd Floor(705) 671-2544www.svrc.on.ca.